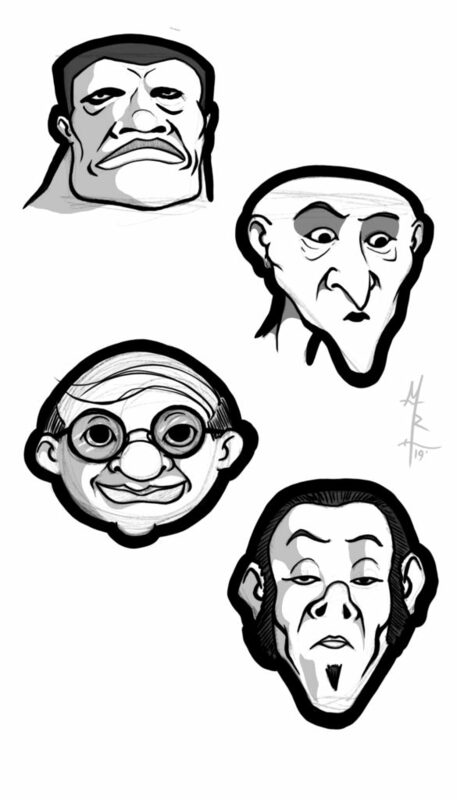 …I created a template for drawing heads from somewhat random geometric shapes. It was meant as an exercise to keep myself doing something a bit more stylized and less like my normal stuff. It worked. I enjoyed the little experiment enough to try coloring the characters that resulted from the shapes and even stretched a little bit there by using color combinations that were… alien to me. There’s nothing world changing about all of that, but when I recently did some Wild West themed illustrations for a client it got me to thinking about how I need to stretch a bit more and try styles and expressions that I don’t do normally. Keep my artistic muscles limber, if you will. So I decided to bring this little exercise back. This time, however, I thought I would walk through the process with folks in a simple ‘how I do it’ post. Again – nothing life changing, but if it helps even one person, I’ll consider it work well done. Step 1 – The Shapes. 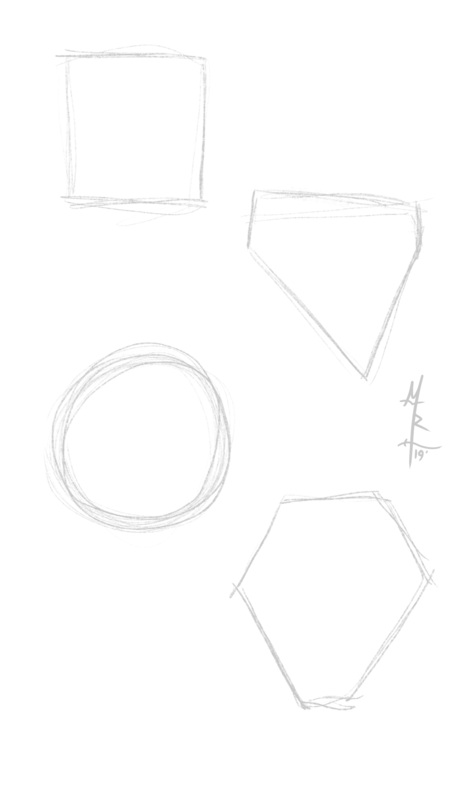 First up, we draw the rough geometric shapes we want to use for the heads. Nothing special here, but I make a concerted effort to not think too much about what I’m going to do with these shapes as I draw them. I want the ‘exercise’ portion of the experiment to be later in the process. So for now, it’s just four quick, simple, geometric shapes. 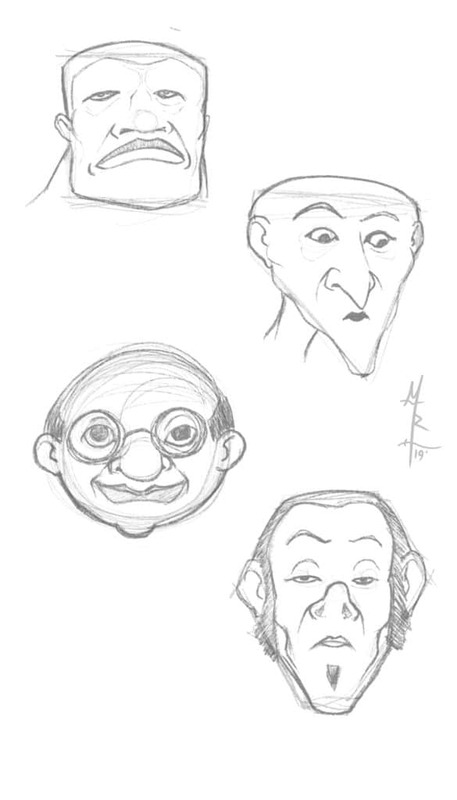 I do go so far as to try to make them well… maybe not unique, but at least different from each other. After I create the shapes, I drop the opacity of the layer to 24% (I have a thing about the number 24 – you should feel free to simply round it to 25%) and then add a new layer on top for the next step. Next, I rough in some face details. In this exercise, I make it a point to not focus too hard on anything. I don’t care if the elements are ‘right’. I just want interesting characters, so I put my efforts into things like odd characteristics, goofy facial features, and pushing my generally bad skill of expression a greater variety of emotions. And more importantly, I work at doing these fast. This is meant to be an exercise – there’s no client waiting for a refined finished product, so I might as well have fun with it. This is arguably my favorite step and it involves the most creativity. Since this is so ‘loose’, I really get to go with whatever my creative side spits out and not worry about getting it ‘right’. Just like the end of Stage 1, when I’m done with Stage 2, I drop the layer opacity to 24% and add another layer on top. And okay, so it’s not really inking per se, since this is all digital, but it’s the computer equivalent of traditional media inking. Much of my technique originates from traditional media methods of comic book creation. Not because I ever made any comics, but that’s where I learned how to draw – reading about how comic books are made and studying the comics themselves with a religious fervor. Back then, there was no version of digital. What can I say? I’m old. At any rate, for this layer, I use an inking brush that doesn’t vary its diameter much. I want some variance, but by keeping that variance fairly small, I feel more comfortable moving faster. I’m not sure how much time this saves me in the end analysis, but it’s how I work as I’m writing this post. I also slapped in some very quick shadows by adding another layer under the inks layer, selecting the areas I want to be in shadow, filling them with black, and then dropping the opacity of that whole layer to 24%. Then, for areas I wanted shadows with just a touch more depth (like the triangle head’s eye shadows), I repeated that process exactly – add a layer underneath the shadow layer, select the regions I want darker, fill with black, and drop the layer opacity to 24%. Why do tones in whole layers like this? I find that it’s fast and it keeps me thinking of the whole picture rather than singular small elements. I don’t go into too much detail this way. This stage, by the way, normally is switched with Step 5 below. I’m not sure why I switched it up today. So you remember how in Step 3 I said I keep the inking brush from varying it’s thickness too much? This is the point where I make up for that. 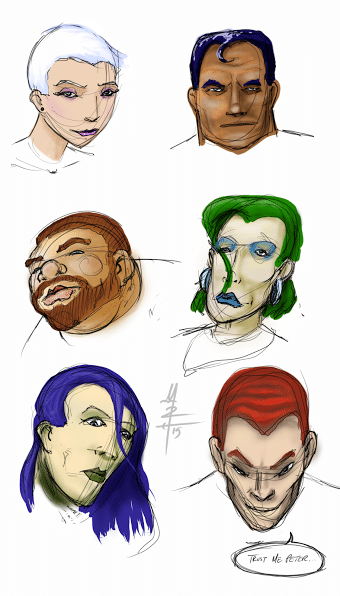 In this example / exercise, there actually isn’t too terribly many places where I do significant line weight variance, aside from the thick border around the outside of the heads, but this is the stage at which I would do it. If you’ve been following along for a while, you’ll have noticed that I like that thick border around my character illustrations. I do that for a number of reasons, not the least of which is the fact that it brings me back to that childhood excitement I had as I would buy stickers from a gum ball machine. They almost always seemed to have a thick, bold outline around them. Also? I just kinda think it looks cool. And that’s about it. 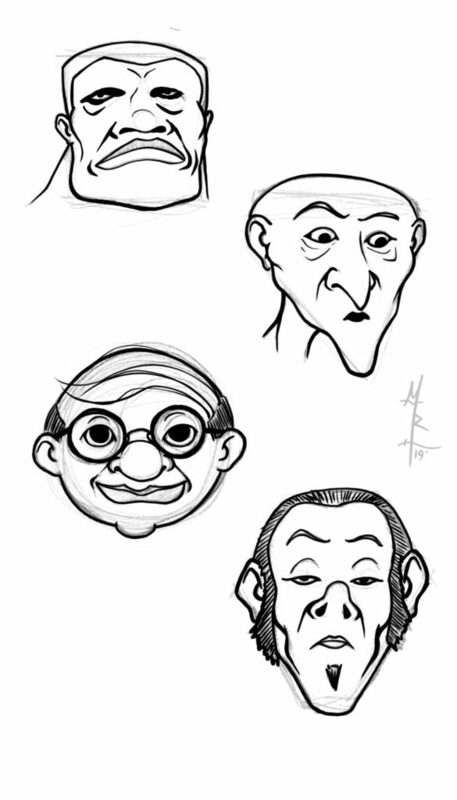 When working fast and loose like this, I don’t like to spend too much time on a set of characters like this. Maybe an hour for all four. But as I mentioned before, this isn’t like a finished product for a client – it’s usually just to get warmed up to do that client work or to kill some time and exercise my creativity muscles while I do. Did you try this little exercise? I would sincerely love to see the results. Feel free to post a link in the comments below to where I can see them! Tagged art exercises, art tutorial, head shapes, heads, tutorials. Bookmark the permalink.